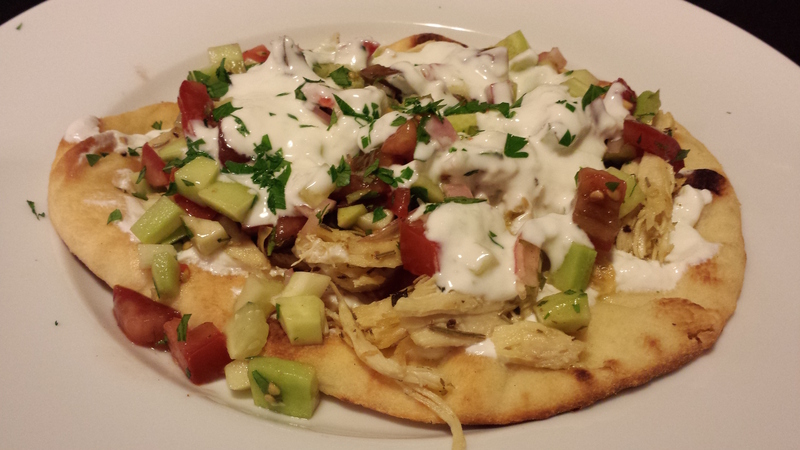 Open Face Chicken Gyros. Weeknights are usually busy for all of us. After battling traffic, who wants to come home and slave over a hot stove for hours? 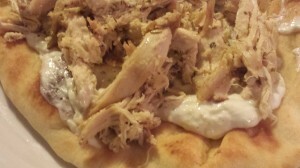 My easy Open Face Chicken Gyros are simple to make and kids love them! Pulled cooked chicken, a tomato cucumber salad, and a greek yogurt tzatziki spread top warm flatbread for a tasty quick meal. 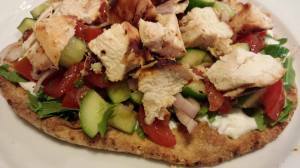 You can make your own flatbreads or purchase them at your local bakery or grocer. You can also use some nice plain and flavored Naan flatbread. Stock up and freeze some for later use. 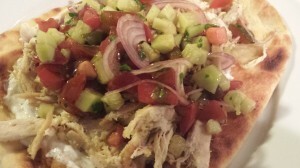 You can also choose pita bread for this recipe. It’s up to your tastes. This is a simple recipe with only a little bit of stove and oven time which you can omit if you wish. It’s a great way to use some leftover chicken from a previous meal. Or you can purchase some pre-cooked rotisserie chicken at your local grocer. Stir together the tzatziki dressing by combining Greek yogurt, peeled grated cucumber, minced garlic, fresh lemon juice, and a pinch of salt. Set aside. 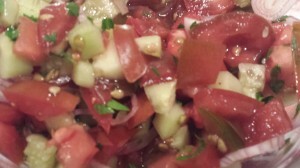 Combine chopped tomato and cucumber along with a thinly sliced shallot and some chopped parsley and mint. Add some red wine vinegar, stir, and let that meld a few minutes. 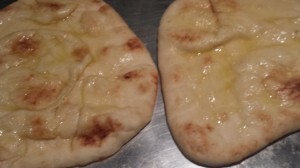 Brush two flatbreads with some olive oil. You can heat the flatbreads or serve them at room temperature. I prefer to heat them so they become slightly crispy. Keep warm until ready to assemble the gyros. Saute some pulled chicken in olive oil with dried oregano and rosemary. 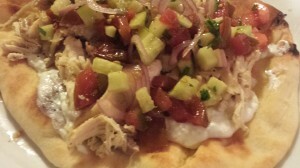 Spread the tzatziki sauce on the warm flatbread. 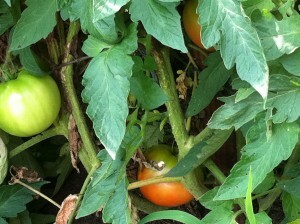 … and top with the minty tomato cucumber salad mixture. 1. 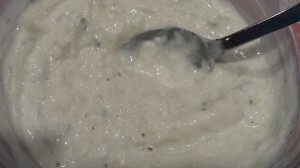 Make the tzatziki dressing by stirring together the Greek yogurt, grated cucumber, minced garlic, lemon juice, and season with a pinch of salt. Set aside so the flavors can meld. 3. Heat the olive oil in a skillet over medium heat. Quickly saute the pulled chicken with the oregano and rosemary. Remove from heat, set aside, and keep warm. 4. Brush the flatbreads with some olive oil. You can heat the flatbreads in your oven or in a skillet on the stove, or serve them at room temperature. If heating the flatbreads, place on a baking sheet in a preheated 350 degree Fahrenheit oven for about 5 – 10 minutes until warm/crispy. 5. 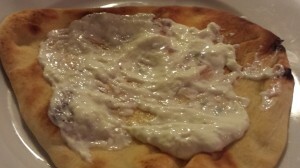 To assemble the gyros, spread some of the tzatziki on the flatbreads. Top with the seasoned pulled chicken and the tomato cucumber mixture. Serves 2 as an open face sandwich or main course. 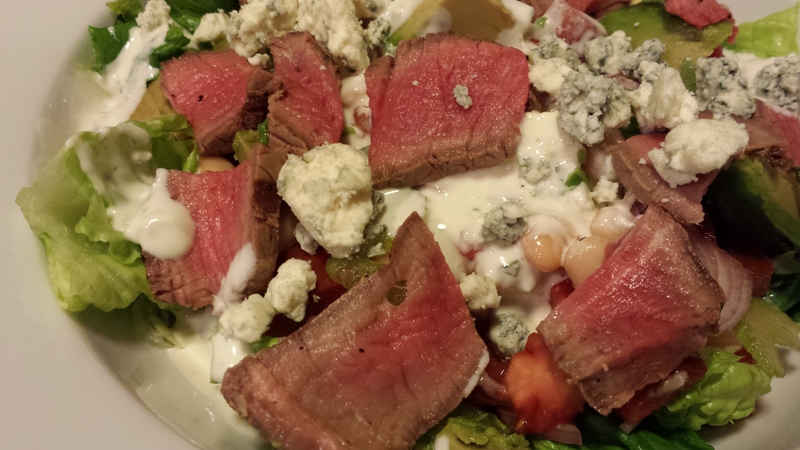 You can drizzle additional tzatziki sauce on the tomato cucumber mixture if you like. Garnish with some chopped mint. Goes well with some white bean dip and pita chips on the side. 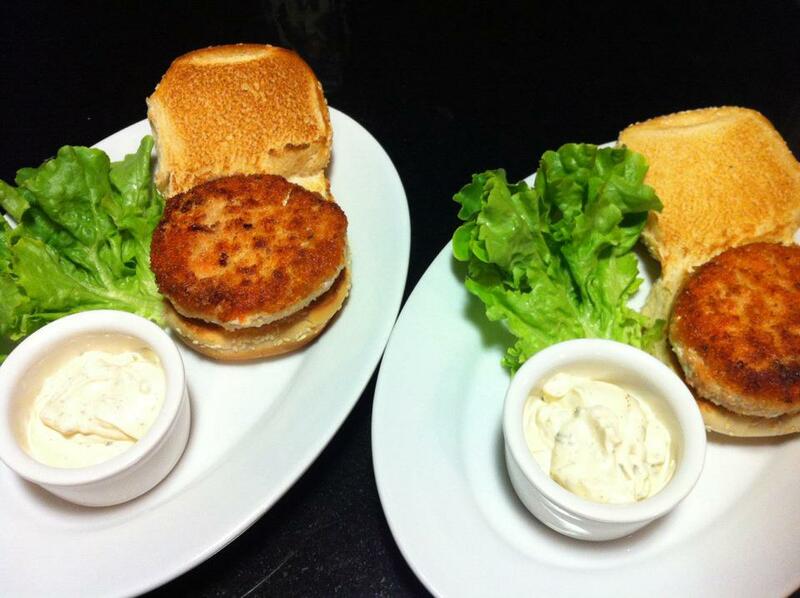 And for kids with a more basic palate, you can omit the herbs and garlic for their portions. Variations: For a traditional Gyro, use grilled lamb meat. Also, you can use browned ground beef instead of the pulled chicken. 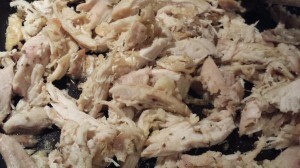 Grill and dice a chicken breast if you don’t want to use pulled chicken. Use chilled and peeled shrimp instead of chicken for a different taste. You can add some shredded lettuce, diced bell pepper and/or carrot to the tomato and cucumber mix for more of a “salad” option.